January 31st passed by and we still don’t know the date of Spotify’s launch in India. Looking at the other side: Deezloader Remix was supposed to be abandoned by the devs and was threatened by Deezer afterwards. What an awful month end for music streamers! The whole ‘Deezloader’ scene is full of dramas. 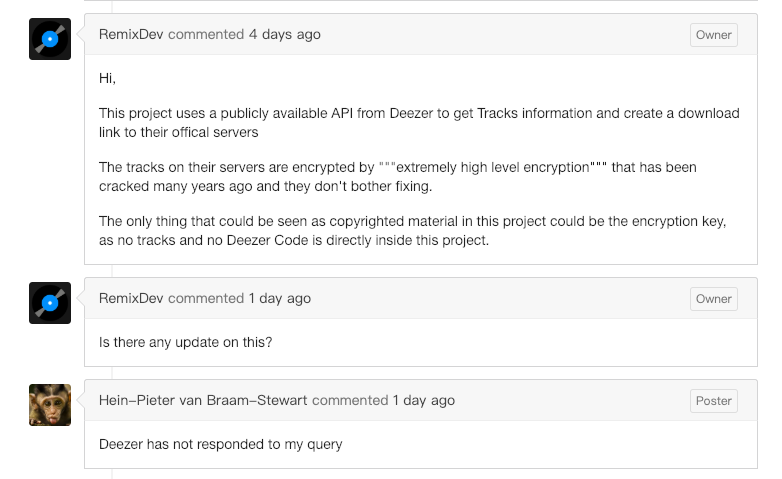 Deezer is always careless about the loopholes in their server side protection. The free tier API is sufficient to access the music catalogue and download high quality digital copies. The definition of piracy and the applicability of the term are little bit complicated in this scenario. The core of this Deezloader forks relies on the public APIs provided by Deezer. 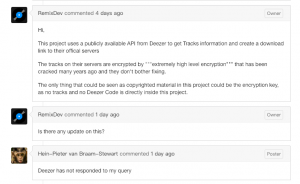 Music tracks are fetched from Deezer’s own server using the compromised encryption key. Well well well – NotABug.org , the hoster of Deezloader Remix codebase, sent their queries to Deezer against the takedown notice (which did not mention DMCA explicitly). They mentioned the arguments similar to the above ones, and guess what? Deezer has not replied back since then. The community is sceptical about the situation for now, as the developers already announced about abandoning Deezloader Remix altogether after the upcoming v4.2.0 update. Hold your horses! 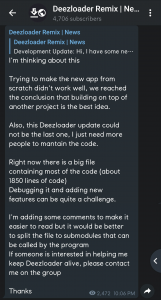 Another interesting development of the affairs is here – RemixDevs hinted about possible continuation of Deezloader. Trying to make the new app from scratch didn’t work well, we reached the conclusion that building on top of another project is the best idea. Also, this Deezloader update could not be the last one, I just need more people to mantain the code. The amalgamation of the downloaders AKA Remix Downloader is kind of far-fetched right now. RemixDevs want to divide the main component of the Deezloader to multiple smaller submodules so that it can be easier for the community to maintain and debug. They are asking for new developers and contributors to materialize the vision. The faster it can be done, the easier it will be possible to incorporate under the AIO downloader. FYI, the current version of Deezloader Remix (v4.1.6) is still operational with some minor glitches.